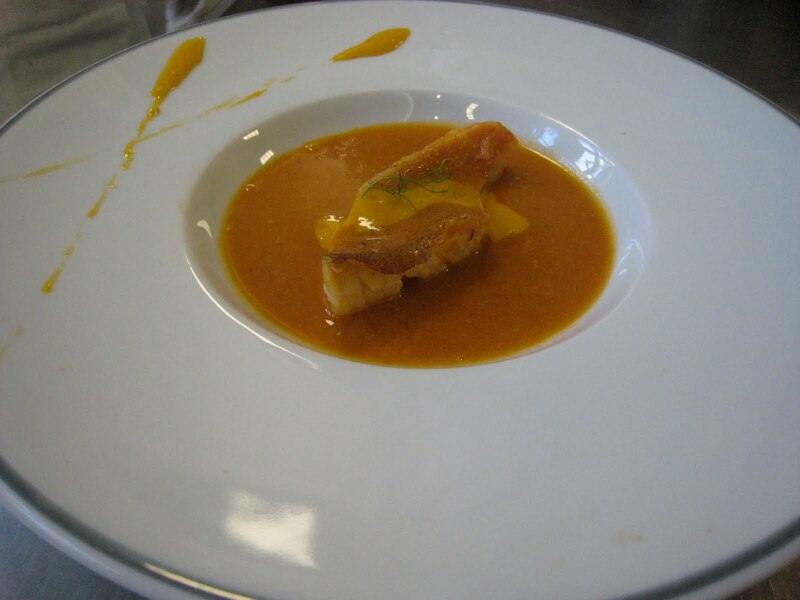 So today we did a Fumet de poissons (fish stock) and Soupe de poissons accompagnée d’une sauce rouille. 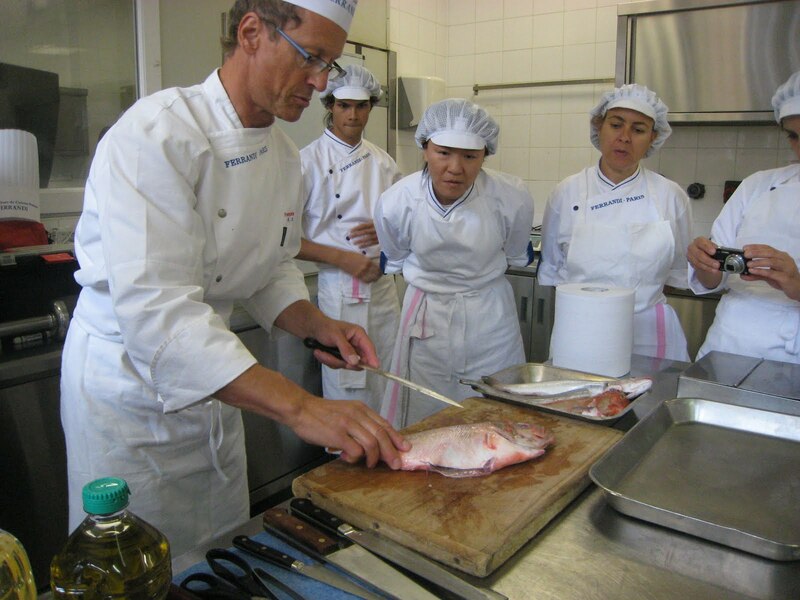 The fumet itself is pretty straight forward but it was dealing with the fish that made things messy…We had 4 differents types: congre (sea eel), rougets grondin (little red fish), merlan, and sole (i think) and we had to descale, empty the guts and clean them. Normally of course, the fishmonger will do this, but it was to get us in the experience…and it was messy. Already descaling the fish went all over the place in the garde-manger and the guts weren’t so pretty as they were quite mushy. Afterwards, we sauteed them in butter, added the vegetables (shallots, onions, leeks, garlic), covered it with water and white wine and let it come to a boil then add the mushrooms and the bouquet garni (garnished bouquet: thyme, bay leaf, chervil tied together through a piece of leek). While this was cooking, we headed onto the Soup. For the soup, we sauteed in olive oil the remaining vegetables (onions, leeks, fennel, garlic), then the leftover fish. 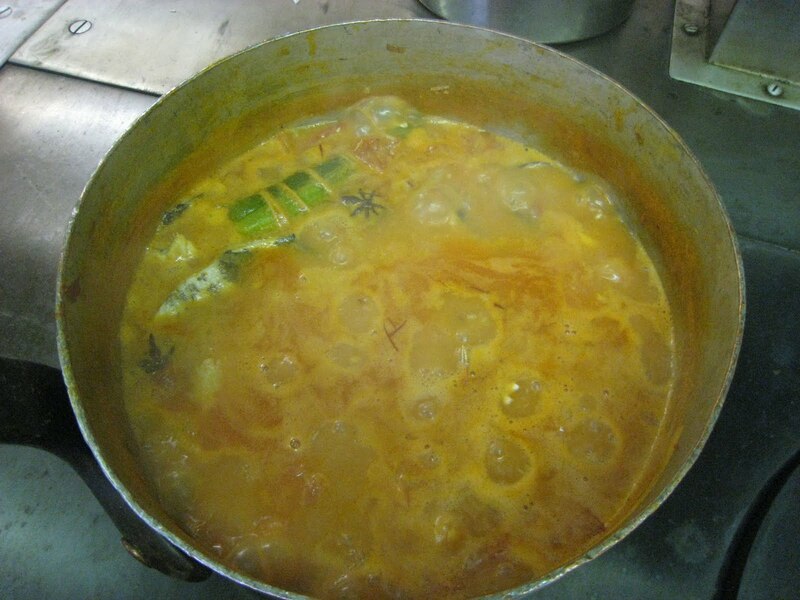 Eventually we added the fumet, the bouquet garni and let it all come to boil and added tomato paste and badiane (star anis). Chef Antoine also let us use some of his spices including Safran and piment d’espelette (a variety of chili pepper) among others. When the soup is nice, red and boiling, we bring it to the mixer and then strain it through a chinois to have the end result: yummy red looking soup. Then we make the rouille made up of crushed garlic with salt, egg yolks, 1/2 lemon, 1-2 tablespoon of the soup that was reduced to a thicker sauce (also known as glace) and olive oil whisked altogether to get a mayonnaise-type thickness. We fillet some of the fish (in advance) and sauteed them quickly in the soup (2-3 tablespoons) in a separate pan and below was the final presentation. Yum yum! Tomorrow, early rise for Le Menu Régional: Provence…But, can’t wait!